I am seeing variable length transmissions in an as-yet unidentified data mode coming from due south of IO93NR08. The transmissions are centred on 144.3743MHz and last from a few hundred milliseconds to about a minute, with varying gaps. The modulation starts with a 200ms burst of what looks like two tones about 50Hz apart, then the main transmission looks like a symmetrical Gaussian shape, around 6kHz wide at -15dB from the peak. It is only about 20dB over noise here, but it appears to be a fair distance away as it shows a lot of aircraft flutter, and the zero beat is when there is a plane at around 190 degrees from me. It sounds like noise on SSB/FM/AM. Direction includes Finningley/Robin Hood, Leicester, Oxford and Southampton. Anyone else hear this? It is pretty regular, but only a problem when trying to work EA/CT on MS. 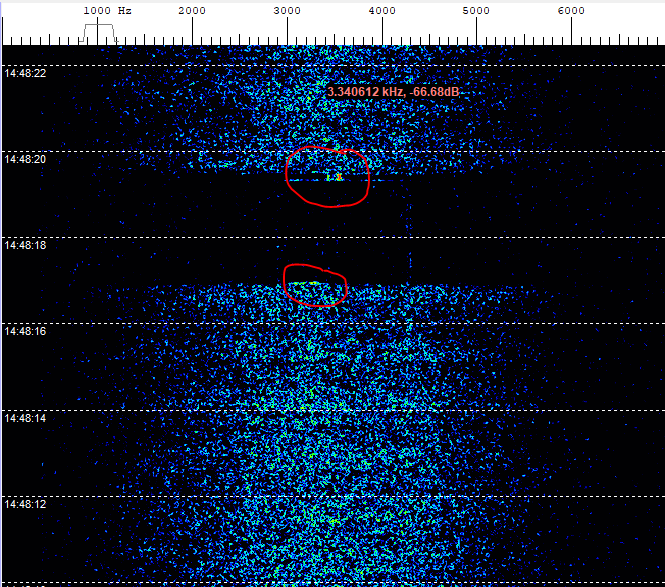 Frequency shown is the 14MHz IF of my transverter, in USB mode.